At age 13 I had an accident playing with a homemade go-cart and broke two ribs. The pole that impaled me started me on a chronic condition (several months) of very sore abdominal muscles which were only temporarily relieved by osteopathic treatments. Finally in desperation I started on an exercise program that pulled me out of it. Thereafter I did gymnastics at the local YMCA and other regular exercises. A lot of my motivation was the desire to grow and catch up to the other kids my age, but it never happened. We lived close to Tampa Bay, and my greatest desire was to have a sailboat, but we were too poor to afford much of anything. When I was in the 8th grade of school I determined to build one, but all I could afford was one sheet of 1/4 inch plywood and some 1x1 strips for holding things together. My "Manual Training" instructor at school thought this was a poor idea, but went along with it. I made everything, including mast and sail, and it actually sailed - sort-of. That boat was stolen - maybe a blessing in disguise. Then I mowed lawns to earn enough money that with a friend we scraped together $10.00 to buy a rowboat. We had a pretty good time with that boat, and I soon bought out his $3.00 share. That boat was stolen too. 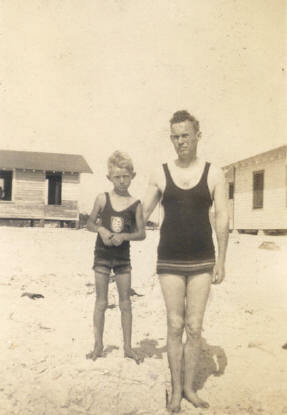 Then my father bought for me another rowboat for $10.00, and that was better. I covered a lot of mileage with that. I tried to outfit that boat for sailing, but it wasn't much good for that, so I removed the keel I had attached. Finally that boat was stolen too. I had no way to secure a boat from thievery, so theft is what happened. 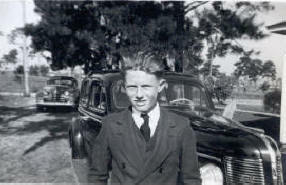 In this picture I was 16 years old and allowed to drive the family car. We were lucky to have a car, because this would have been in 1942 (war years with rationing of rubber and gasoline). Some people bought second hand cars just to get the tires from them, and we had a friend's car in our back yard sitting up on blocks with no wheels. Then my father got for me a junior membership in the St. Petersburg Yacht Club. This was great! I don't know how he managed that, because we were not in that social class. The Club had a fleet of six fish class sailboats. That boat is no longer popular, but it was a heavy-duty racing boat, about 20 feet long, with a lead weight on the bottom of a fixed keel. I could be wrong, but I think the weight was 600 pounds. 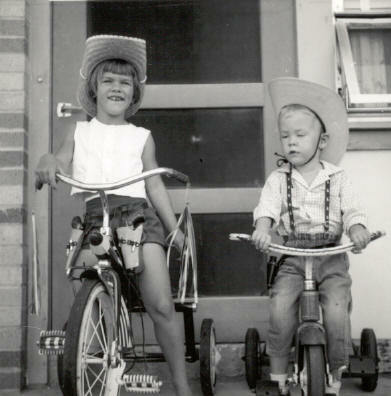 We often had races with a crew of three. I did very well at that, and really loved that boat. I have some pictures of it in the page of my sailing days. Also at this time, a doctor friend had a 42-foot schooner, and I quickly became permanent crew. Dr. Bill Jennings later became Commodore of the Club. In junior high and senior high school I had first an afternoon paper route, but it was too small to earn much money, so I soon got a morning paper route with the St. Petersburg Times, which involved going to work at 4:00 a.m. This was good experience, with about 300 customers. A little later I began to substitute for one of my classmates whose job was "fly boy" on the press, and I did that about twice a week, sometimes more. To do that, I swapped my large paper route for a smaller one. The fly boy's job was to pick up papers in groups of 50 or 25, depending on the size of the edition, from a conveyor belt, "thunk them down" on his leg to get a better grip on them, turn and walk about five feet to a window, and throw them to a person on the other side of a table in an adjacent room. That person again had to manipulate the papers to get a good grip on them, and make up bundles to go to the various delivery sites. This job began at 2:00 a.m. and normally ran for about an hour and a half, but longer on Sundays. It took some training to handle the papers this way to keep up with the printing press, and could be a disaster if some were dropped, because then one might slide all over the floor and you can imagine the results. My biggest memory of this job was one Sunday morning during the annual Festival of States week, with the biggest edition the press could print. There were lots of "web breaks," in which a roll of newsprint would break, requiring that the press be stopped and re-threaded, resulting in a lot of "spoils" coming up the conveyor belt and having to be stacked off to one side. That press run was a real challenge, and I was exhausted. The press foreman told me I had picked up 17,000 pounds of paper (in about 3.5 hours), and I lost 6 pounds! Fortunately, weight lost that way is quickly regained. When I was 16 years old, I had a job taking care of the tools at a public woodworking shop. For keeping all the tools sharp and oiled to prevent rust, plus sweeping the floor, I got a small stipend and free use of the workshop for my own projects. Someone had begun construction of an 8-foot pram sailboat. Somehow I acquired it, finished it, had a professional sailmaker make the sail, and had my own sailboat! But what can you do with an 8-foot pram? They are mainly for pre-teenagers. The nation was still in the great depression, and "The Workshop" business failed. In closing down, the owner gave me a fairly complete set of carpenter tools, many of which I still have. After a few months I sold the pram. By the time I was 17 years old, I had completed the basic course in the United States Power Squadrons. With passage of some exams in high school, plus recommendations from Dr Jennings, the local Power Squadron leader, and my high school principal, I was accepted for the wartime V-12 Program (Naval officer training) immediately following high school. I turned 18 years of age just before graduation, and so had to register for the "draft." My high school annual called me "Sailbad the Sinner." The Navy called me to duty at Duke University in November, 1943. 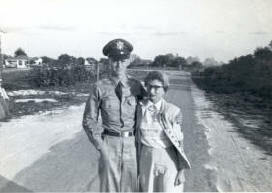 In the years 1940-43 we lived in a three-story apartment house very close to the local airport in St. Petersburg. I slept on the back porch on the top floor, where I could view air traffic and go to sleep at night listening to a bugle playing tattoo and taps at the merchant marine training base. I never dreamed that one day I would be piloting airplanes to that airport. 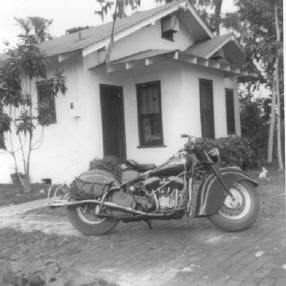 This picture, taken in 1947, shows the Indian Chief motorcycle I had for about a year. It was new, and difficult to get because factories were trying to catch up from no production during the war years. I once drove that thing "non-stop" from Chicago to Pensacola. The picture has lost its color; it was bright red. 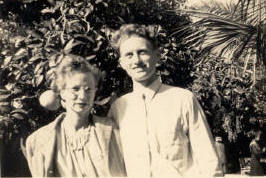 At this time I was renting a room in that house while attending Florida Southern College for teacher training. These pictures show me with my mother. I'm only 5' 8" so you can see how small my mother was. For most of her life she weighed less than 100 pounds. I think that's why I have such a slender skeleton. I was only about 18 in the first picture. The second photo was actually snapped several years after the first. It looks like I've grown a few inches, but It may be that my mother had already begun to lose some height from age. 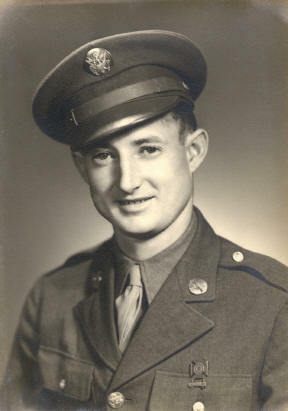 This is a picture of my brother, "Buddy," taken during or shortly after the end of World War II. He was in the "battle of the bulge" in Germany. He was 4.5 years older than I, and died in 2009. 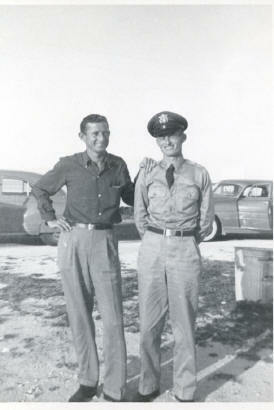 This picture of my brother and me was taken about 1953 when I was an Air Force flight instructor. I served during three wars, but was never sent to combat. During the "cold war," I piloted a nuclear bomber, but never took off with a bomb, not even a practice bomb. However, I often stood alert duty, with the airplane "loaded and cocked," ready for war. Here you can see my first wife, Bernice with our two children, Maria and Lloyd. 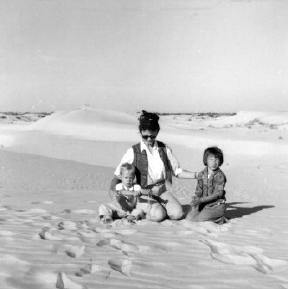 At that time I was stationed at Webb AFB in Big Spring, Texas, and we had taken a day trip to Monahans Sand Hills State Park in west Texas. These "little wranglers" were in front of our house on the Base in Big Spring.